My sermon from the 6th Sunday of Easter (May 6, 2018) on 1 John 5:1-6. Listen to the recording at the bottom of the page or read my manuscript below. That….is a fun word. And when I sit down to write the first draft of my sermon, I find myself writing the word “that” over and over again. I use it when I want to emphasize a particular point or when I want everyone to understand that this sentence is super important….like I just did, right there. “That” is a useful word but it’s also usually unnecessary. I don’t remember the specific grammar rule dealing with the word “that,” but the second and third drafts of my sermon involves removing the “that’s.” They’re usually repetitive, redundant, and rarely make my point as clear as I want it to be. So I scrub “that” from my writing as best as I can. But I’m glad to see, in our reading from First John, a completely unnecessary “that” shows up. We’re at the beginning of the fifth , and final, chapter of this letter. The author is trying to make a very specific point about Jesus and why his human life and his human death matters. So the author starts the fifth chapter with “Everyone who believes that Jesus is the Christ has been born of God…” And right there is a perfectly good example of a “that” that doesn’t need to be there. “Everyone who believes Jesus is the Christ has been born of God…” is totally understandable. Both versions say the same thing – “everyone who believes Jesus is the Christ;” everyone who knows Jesus as the Messiah, as the Son of God, as the one who lived and died to save you and the entire world – if you know that Jesus, then you have been born of God. The author of 1 John didn’t need a “that” in the opening sentence to chapter five. But the author made sure to include it. The author had something they wanted to emphasize. And by adding a “that,” the author of 1 John pointed out to all of us how our words about faith will change as we spend our days and months and years following Jesus. Now, since today is the day after Trash and Treasure, I will continue my tradition of using something I found at Trash and Treasure as my sermon illustration. And what I found at yesterday’s sale is…this. 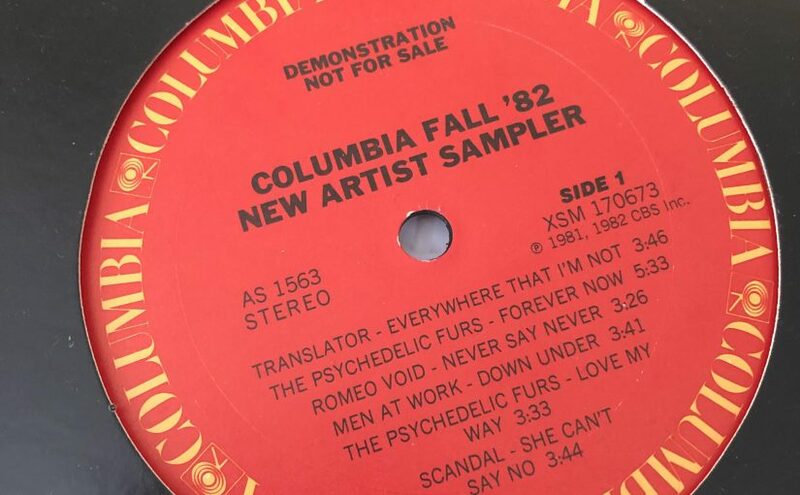 It’s a vinyl record it’s called “Columbia Fall ‘82 New Artist Sampler.” On this album are songs by groups like “Men at Work,” “Translator,” “Scandal,” and “The Psychedelic Furs.” The record doesn’t have a real album cover. And I don’t think it was supposed to be found at a store. In fact, written on it, are the words “Demonstration. Not for sale.” We can imagine this record being mailed to radio stations, music reviewers, and whoever the marketers at Columbia Records thought might actually buy an album from a band named Scandal. The record is a sampler, designed to give the listener a taste of what these new-back-then pop bands were all about. Like an appetizer before a meal, this album would wet our pop music palate, and Columbia records hoped we would go out and buy or review or share the real albums of the bands showcased on this sampler record. But flash forward to today, and here I was, 36 years later, doing exactly what this record told me not to. Someone I don’t know dropped this album off at church. And I have no idea if they ever listened to it. In the pile of records where this album was, not one of the bands listed in this sampler were actually there. This album maybe didn’t do its job – so it was brought to church and we listed for sale. Together, the person who donated this album, this church, and myself changed the rules spelled out on this record’s cover. But I’m not too worried about breaking this album’s rule. Because it’s been 36 years. None of the bands listened on this album are now new. I can find, and listen to all their albums right now on Spotify and Pandora and Amazon and countless other online streaming services. That reality didn’t exist in 1982 so the reason for this album’s existence, in our current context, isn’t the same. The world this record lives in has changed. But it’s core identity – as something I can put on a turntable and listen to for hours on end – that remains the same. The “that” in the first verse of chapter five shows us something important. It shows us how the community surrounding the author of 1 John struggled to define what “belief in Jesus” was all about. Jesus, as we hear in the gospel according to John, is always saying things like “believe in me” which is great…but as we spend months and years and decades living with Jesus, and as we share our faith with strangers, and friends, and even our kids – nailing down what this Jesus thing actually is – is hard. Over time, our words change. We start saying “that” a lot as we highlight the experiences of faith that mattered to us and that we believe books filled with what we know is essential to faith and start writing, and repeating, creeds – not primarily as a way to limit faith but as an attempt to put our relationship with Jesus into actual words. Jesus, in this kind of process, doesn’t actually change. But the world, our society, and ourselves do. What we say about Jesus and about our faith evolves and grows. We gain, over time, new words to say and we toss aside the old ones. We give thanks for the perspectives of faith that brought us to this point but we stay open to new thoughts and new point of views that will end up growing our faith in ways we can’t currently imagine. The “that’s” of our youth won’t necessarily be the “that’s” of our old age. But any “that” that we use does matter. What we say about Jesus – his life, his death, his Cross, and his resurrection – are more than just simple statements of fact or opinion. They are words that shape what our faith can look like and informs how we live our faith out loud. As the community around the author of 1 John changed, so did the “that’s” of their faith. The words that fed the faith of the original disciples were words that needed to be expressed in new and different ways. The “that’s” started to change just a few decades after Jesus resurrection – and those “that’s” keep changing, even today. Because our lives, here in the 21st century, do not look 100% like they would have if we lived in Jesus’ time. He, I’m sure, would have no idea how to react to the music of an 80s pop band like “The Psychedelic Furs,” or what to even do with a vinyl record found in the middle of the Judean desert. Yet even though we live different kinds of lives compared to Jesus’ first followers, our need for his presence, his mercy, his forgiveness, and his love are just as important. Our language of faith has changed and that language will change again. We will, together, struggle to find words for our new realities. We will disagree with each other about what new “that’s” we currently need. But as long as we cling to Jesus, stay close to his presence, and hold onto his core identity as the very human / and very divine Son of God – we will discover, with the help of the Holy Spirit, the right “thats” God knows we need. And through this new word, God will enable us to do what Jesus calls us to always do: when it comes to God, to our neighbors, and to each other – our “that” is always love.